Hum­ming­birds.….…. They seem to be lit­tle pets around our place! We set out feed­ers just out­side our win­dows just so we can have a birds eye view of these lit­tle guys and even give names to some of them. Most of my shots are tak­en through the glass so I’m not dis­turb­ing their space. Some­times they will just hov­er look­ing straight at me, then dart away as to say, times up. Here is one it took this morn­ing. 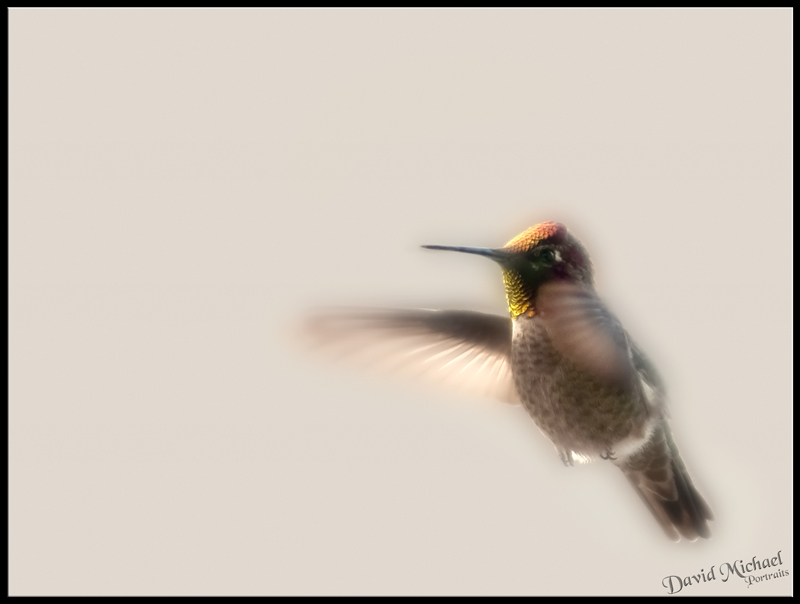 This entry was posted in My Own Backyard, Wildlife and tagged hummingbird. Bookmark the permalink. I real­ly love how you have your blog set up, Dave. Its so much an inte­gral part of your web­site and shows your work real­ly well. I have it linked now to my blog so I’ll be able to eas­i­ly see when you make a new post. I ‘mag­ine with all the changes about to take place with David Michael Por­traits, some fre­quent blog posts to keep your clien­tele updat­ed — and even to begin the mar­ket­ing process in Flo­rence will be a real­ly good thing. Bless­ings and prayers on every aspect of your busi­ness! Not that I don’t loooove your lit­tle hummingbird…butttttttt.…I’m sti­i­i­i­i­i­il­l­l­l­ll wait­ing for more words of blog­ging wis­dom here.… ? ?